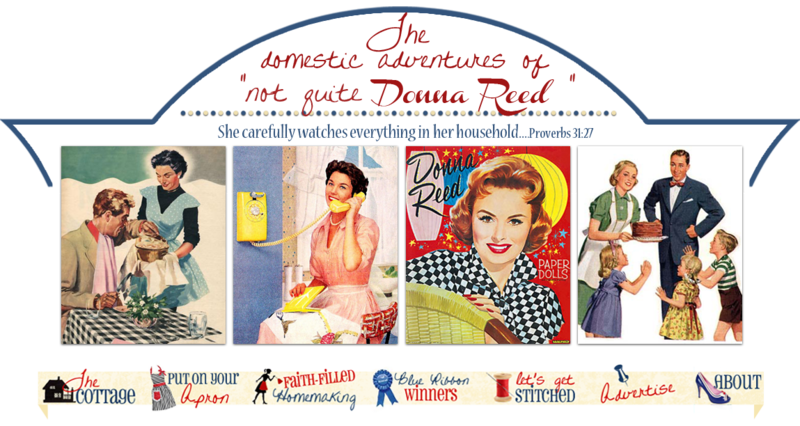 Not Quite Donna Reed: Holiday Traditions::Which ones? Each family has those traditions that they can't live without. 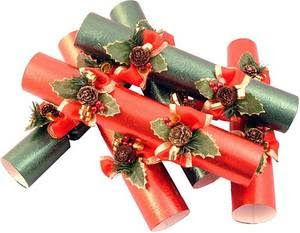 If my Christmas table is missing the English crackers that for years have adorned each persons place settting, I fear an uproar would happen! Each year after dinner we crack open the crackers and each person reads their corny joke, passes their toy and then dons their paper crown for the family Christmas photo. We all look as goofy as can be but every year I put that photo into the scrapbook and we all get a good chuckle from the previous year's photo. We've done this for as long as I have set up housekeeping and it's now part of our holiday traditions! Which traditions are important to your family? Do you even have any? Christmas dinner here is always prime rib and there is french bread pudding with brandy sauce and plum pudding for dessert. Another of our traditions is our Italian cookie platter. Thanksgiving dinner always has gourd soup as the first course. It is funny, anyone who regularly dines here for either holiday will ask if the above courses will be served:-) It's these little traditions that kind of stamp your holiday, create memories to dine on throughout the year. We're a busy society, no doubt about it. Consider what you have time for and don't beat yourself up for what you don't have time for. Keeping or instituting one family tradition is better than stressing yourself out during the season. Consider the cost of what you want to do so that doesn't stress you out. Then calculate the time you need. Do you knit all your kids new mittens or sew a pair of new jammies for each child? These things take time so plan accordingly. This year I am going to try freezing cookies~gasp! I always swore I would never freeze a cookie! Yet, as I want to do a few more things this year I realize that all things cannot be done the week of Thanksgiving or Christmas. I must allow the appropriate amount of time for things so I can have joy! I am also going to decorate the house a bit earlier this year. I am not waiting to put up my tree either! I am endeavoring to do things early so I can sit back, relax and enjoy the fruits of my labor. And be authentic! Don't compare yourself or try to be someonelse!!! My friend LaVonne, who has gorgeous wool for any of you that spin, felt or do punch wool, sent me this quote and it is so true. Always be a first rate version of yourself rather than a second-rate version of someone else. I love Ann's blog! She is also sharing her secrets for preparing for the holidays. Please pay her a visit and she has a wonderful tutorial for "Christmas Crackers". Ann also jogged my memory to remember the postal system and holiday shipping guidelines. Standing in a long line at the post is no fun so plan that accordingly. And this sweet tutorial for rag-tied garland is fantastic! It gives such a homey feeling. And a bit of a home tour for some simple holiday. Is this house not darling! I want to be invited to dinner here:-) Notice the natural elements brought in here. Do you or friends have pines or winterberry on the property? Cut some, gather or tuck them into little spots around the home inside and out. A very economical way to decorate! But, most of all remember to keep the Saviour as the focus, all the traditions, decorations and delicous recipes aren't worth a fig if Christ and his birth is not the focus. I enjoyed the house tour so much! That's the style I love the most. I just recently discovered Behind My Red Door.It's wonderful! BTW, I'm loving your music. Making me feel very nostalgic ! I love tha quote about being authentic - perfect!! And that house tour is wonderful. Great post!! Linda and Jane thanks so much! I would love to create some true traditions just for my household. I love all the things here on your blog,and well as for Ann at Eight Acres,How can you not feel excited and inspired by her enthusiasm! Just found you by way of Linda...I too am a New Englander.....Maybe we could visit Linda's house together sometime!!! LOL! Love your blogs! Thank you so much for featuring my Christmas blog Suzanne. I think it is wonderful idea to prepare early and enjoy the fruits of your labour - after all, the stores have their decorations up - why should they have all the fun! I am writing this as my latest batch of photos are uploading for my next post on creating Christmas wreaths for the home. Tomorrow I am off to do a cracker making seminar at a church in the city - I promised I would do this one providing I had not gone into labour which I have not thankfully! My EDD has been revised to 20 Dec so I have more time to get ready for Christmas! I must visit those other blogs you mention too! What a wonderful blog this is! Both of your blogs are and I just became a follower of both. I must say I'm so thankful to know that Christ is first and you expressed that so eloquently, that He should be in all of our lives. Thank you for sharing all your thoughts and tidbits on life. You are a great asset to the bloggin world! I'm a New Englander as well, and found your blog through Linda's. I can't wait to read more of your inspiring posts.